Picture it: you belong to a band of early Paleolithic peoples. As a group, you are running low on food stores, and you need to find a way to feed your people. Will you hunt or gather to obtain your food? Assuming the second option isn’t viable, what sort of tools will you need to hunt? How will you make these tools given the resources available to you? These questions can be answered through archaeological evidence of an art known as flintknapping. Archaeologically speaking, flintknapping can be defined as “the manufacture of stone tools by the reductive processes of flaking or chipping” (Flenniken). 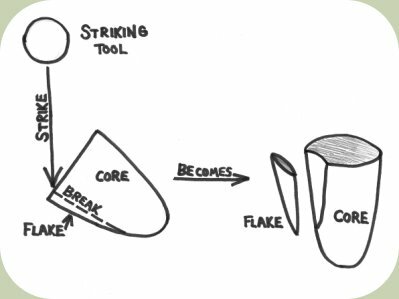 In essence, it involves a process in which stone tools are created by striking a rock at specific points, known as percussion, or by pressure flaking. This practice yields a myriad of tools, such as arrowheads, burins, knives, blades, dart points, spear points, scrapers, drills, and bifaces, among others. Flintknapping enabled people as early as the Paleolithic age to create tools that made aspects of their daily lives easier. The first evidence of flintknapping comes to us in the form of the Oldowan stone tools from Olduvai Gorge, Tanzania. 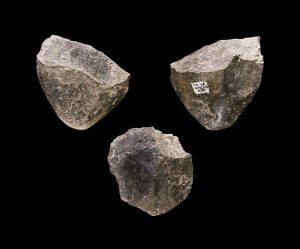 These artifacts date back to about 2.6 million years ago, showing archaeologists that the earliest of humans were capable of fashioning tools, however simple they may have been. The Oldowan tools were composed of choppers and flakes “made by knocking pieces off pebbles to obtain sharp edges” (Renfrew, Bahn, 213). Microwear analysis shows that these choppers and flakes were likely used to cut through plant material and hunted animals. Homo habilis, an ancestral relative of Homo sapiens, produced the Oldowan tools. More likely than not, these early humans wielded the choppers and flakes to shear through the skins of scavenged mammal carcasses, like that of a zebra. Since historical records show that Homo habilis maintained an omnivorous diet, the tools may have also been used to carve fruits or vegetables with tough outside layers. Experimental archaeologists aim to study the past by recreating artifacts and archaeological evidence. In doing so, archaeologists have been able to deduce answers to such questions of when and where early peoples hunted. The study of flintknapping is valuable to archaeologists because stone tool artifacts can be relatively dated according to their craftsmanship. For instance, a breakthrough finding of a stone tool might indicate that humans were using this technology even earlier than recorded or that the first instance of stone technology was at an altogether different region of the world. These kinds of discoveries challenge the ways in which we think of the past, altering our biases and preconceptions of the cultures of antiquity. Renfrew, Colin, and Paul Bahn (2015) Archaeology Essentials. 3rd edition. Thames & Hudson, New York. This entry was posted in Fall 2017 by gverdeflor. Bookmark the permalink. What are somethings that experimental archaeologist can learn from flint knapping themselves? How does making a stone help understand the past? Often their are indicators that determine if the stone tool was either a dart or an arrow, what are some common index’s used in classifying stone tools and what are their down falls?